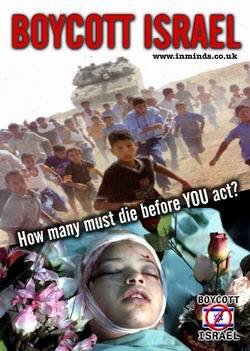 Recently we were approached to design a double-sided full colour A5 flyer on the boycott. 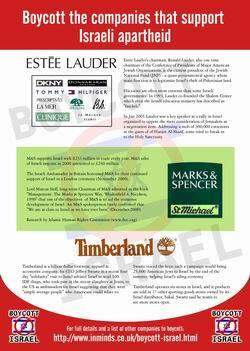 The flyer needed to target three of the companies on our list giving reasons why people should boycott them - Estee Lauder, Marks & Spencer and Timberland. The idea is that in future three other companies could be targeted, and so on. The first print run saw 10,000 copies printed for distribution in the local communities. We designed a generic "Boycott Israel" cover page which can be used else where and kept the details of the three specific companies on the back. The flyer is available for download below. You may use the design in any way to further the cause of Palestine, but we request that you please leave our website address intact so that people wishing to find out more have a reference to follow. The format is PDF and is created at hi-resolution for printing at 300dpi on A5 paper. The cover design of the flyer is also featured in the Islamic Card Centre as a e-card you can send to friends.